Bang & Olufsen, a company known for its audio prowess in speaker and phone designs, is applying its technical knowhow to stethoscopes. Are they qualified? The consensus is yes. 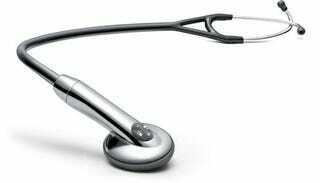 Their E3000 electronic stethoscope has won both the 2006 iF Design Award and the 2005 Danish Innovation and Design award. The device uses ambient noise reduction technology that's used in consumer headphones to filter out surrounding sound by up to 75%. This is probably going to be quite expensive compared to standard stethoscopes, so if your doctor doesn't have it you may have to bring your own. What's next, Leica developing a better colorectal exam?